Oslo, Norway – It is County Championships on a Thursday evening at Romedal stadium just outside of Hamar, 100 kms north of Oslo. An elderly distinguished gentleman is strolling the infield, Javelin in hand . He watches the competition, has advice to the various competitors of all ages & occasionally takes the time to throw himself. The arm is not as it used to be and the range of movement is now more restricted, but there is no mistaking the man who sparked the tradition of Javelin Throwing in Norway, Egil Danielsen, the Olympic Champion of 1956. Since that famous day in Melbourne over 50 years ago, on which Danielsen threw a world record to win his laurels Norway has produced a long line of javelin competitors which impressively jigsaws into the traditions and love of the discipline across the Baltic but especially Nordic region of Europe. Norwegian names like Terje Pedersen, who followed Danielsen’s World record example with two of his own in 1964, Willy Rasmussen, fifth at the 1960 Olympics, Per Olsen, fifth at 1983 World Championships, Arne Fagernes, fourth in the 1999 World Championships, and Trine Hattestad, women’s multiple World record breaker, World (1993 and 1997) and 2000 Olympic champion, have all been at the upper echelons in the world of javelin throwing. The tradition in Norway continues on today at ExxonMobil Bislett Games in the form of the reigning Olympic champion Andreas Thorkildsen. 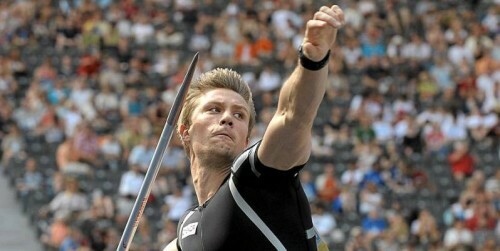 In 2006, Thorkildsen set his personal best 91.59m at the meeting making him the sixth furthest thrower of all-time. This year the Norwegian as usual has the task of repelling the challenge of numerous world class competitors eager to defeat the defending champion in an Olympic year, including his greatest rival Finland’s Tero Pitkämäki. Pitkämäki, whose PB is 91.53 (seventh best thrower on all-time list), is the reigning World champion and inflicted the narrowest of defeats upon Thorkildsen last Sunday in Berlin (1 June) at the start of the ÅF Golden League 2008, when the Finn prevailed by a mere centimetre. In 2007, the Finn for the second time in three years Pitkämäki also inflicted defeat on Thorkildsen in the Bislett stadium. Good news for the fans is that Pitkämäki will start in Oslo despite the back spasm which saw him withdraw from the competition in Berlin after his first, and ultimately winning throw. So he remains a candidate for the $1 Million Jackpot of the ÅF Golden League, and Thorkildsen will be calling upon all the experience, the traditions, the spirit and the pride of Norwegian javelin history as he attempts to seek his revenge upon the Finn. The Bislett venue has seen some magnificent javelin performances over the years with a total of three World Records for the men (two to Pedersen, one to Zelezny) and one to the women (Hattestad). Tonight will surely be no exception and sitting in the main spectator tribune with his eyes glued to the competition will be the man who sparked the tradition off some 50 years ago, the spirit of Norwegian javelin throwing Egil Danielsen.